We are a leading organization engaged in manufacturing and supplying a remarkable range of Medicine Packaging Foil. This range is specifically designed and developed at our well-equipped infrastructure resulting in production of a flawless and high quality range. Available with us is Alu Alu Blister Foil under this range. 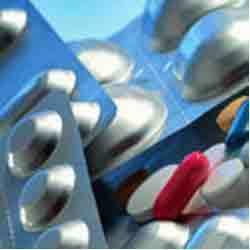 Our offered products are extensively used in pharmaceuticals industries for packaging medicines. Owing to their qualitative features such as durability and resistance against flame & moisture, these packaging foils are widely popular across the market. Foil Material: Fully Soft (0 temper) aluminum of alloy grade AA-8011 conforming to Aluminum Association, USA, specification. Thickness Tolerance: 80% of the length expected to be within +/- 5%, while 20% of the length is within +/- 8 %. Splicing: Smooth ultrasonic welding joint for light gauge throughout the web having 5-7 mm overlap. Splice foil has 80 % of parent tensile strength. Winding Quality: Foil winding on the core will have straight build-up having a maximum interlayer shift of 0.5 mm. Identification: Each reel is identified with a ticket having reel no., specification, mfg. date and number of joints. Marking: Order no, batch no, gross & net wt. and any other details as agreed mutually with customer. Looking for Medicine Packaging Foil ?